Kent Athletic closed the gap on SSML Division Two leaders Hale Leys United by winning 2-1 at home to Aston Clinton on Saturday. The hosts went ahead through Connor Waite’s deflected effort, before substitute George Higley made it 2-0 in the second half. Aston pulled one back, but Kent held on to triumph as they are now eight points behind Hale Leys, with four games in hand, after the leaders were held to a surprise 0-0 draw at basement side The 61FC (Luton). 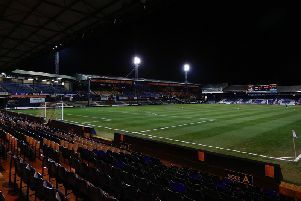 Despite winning just twice all season and conceding 47 goals, The 61FC kept out their free-scoring visitors to earn a 10th point of the campaign. Totternhoe were involved in an 11-goal thriller at home to Clean Slate coming out 7-4 on top. Scott Harvey (8), Gareth Harnaman (36) and Joe Smith (39) scored before the break, but with 20 minutes to go, the hosts trailed 4-3. Kent are at home to Amersham Town tomorrow night, while they visit Belstone in the Anagram Records Feeder Leagues Trophy this weekend, with Totternhoe away at Sandridge Rovers in the same competition. In the league, The 61FC (Luton) go to Old Bradwell. AFC Dunstable Reserves were 4-1 winners in the Reserve Challenge Trophy by beating Holmer Green at the weekend. Lewis Crowys scored twice, while Kane Axten and Jake Kissedu were both on target too. Crawley Green Reserves won 2-0 at Baldock Town in Reserve Division South & East, while North & West Division saw The 61FC (Luton) hammered 8-1 at Pitstone & Ivinghoe. This weekend, AFC visit Baldock Town, with Crawley Green at home to Welwyn GC in the Reserve Challenge Trophy and then travel to Hoddesdon Town in the league on Tuesday night. The 61FC (Luton) host Tring Corinthians in the league at the weekend, with Totternhoe entertaining Winslow United, while on Tuesday, Totternhoe head to New Bradwell St Peter.